I haven’t done a blog post in over a year. It’s about time. First I will look ahead to 2017 briefly. My elbow nerve problem is stable right now (has been screwed up since early 2009). I am excited in that I believe I will probably be better throwing this year than I ever have in the past because I am able to practice regularly and my elbow doesn’t act up. Muse is in top form and looks the best she ever has. She’s only 4 years old, so she still has a few years before she reaches her peak. Slayte (just turned 6) is competing again in freestyle and is showing me he may be able to compete with Muse as my top dog. Key has a lot of catching problems but her drive is pretty high for playing now. If I can get her to just calm down a little bit, she’ll be a much better dog. She managed to have a 40+ 2-round D/A score at the Skyhoundz finals weekend, so there’s hope. Most rounds have more misses than catches. We work on it every day with catching drills. Enzo is still playing even though he can’t hardly see the disc anymore. 2016 Season: Muse had a solid year as usual. She won the Skyhoundz Pairs D/A World Championship, California State Championship (for the 3rd time), D2iSC Club Championship (for the 3rd time) and the Western Regional Incredible Dog Challenge (video below). Slayte, Key and even half-blind Enzo won various competitions throughout the year. The 2015 disc dog season was awesome for us. More traveling, more winning and more fun than ever before. 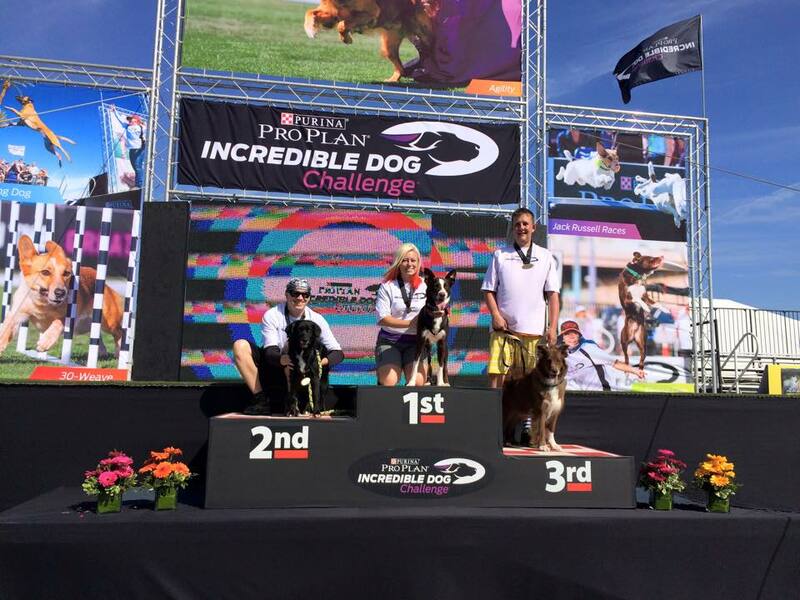 Muse won the Skyhoundz pairs freestyle and sport (distance / accuracy) division World Championships. She also placed 3rd in the UFO World Cup standings and 3rd in the freestyle World Championship. Lastly she won both the California State Championship and D2iSC Club Championship. These are both repeat wins for her. Enzo’s eye sight has gone into the toilet. He’s fine for every day activities but for disc and agility, he can’t see well enough to compete. He’s now retired in both. He will be 10 in the spring and other than his eyes, is perfect physically. He enjoys his retirement by swimming almost every day while chasing a disc! Key qualified for both the UFO and AWI finals, which is amazing for a young dog. This off season is going to be focused on her improvement. I stopped teaching my disc dog class to allow more time to focus on her. It has made a huge difference. Her freestyle is going to be top notch, possibly as good as Muse when the season starts – maybe even better. She’s doing that good. I never had a routine with her and never had enough time to really dedicate to her. It wasn’t fair for her. I fixed that and her improvement is amazing. She has a close routine with a lot of tricks. It’s the opposite type of routine that I have with Muse. Her toss and fetch is terrible right now because she is really bad at catching at long distances. I am working on it almost every day but I am not seeing any improvement. I can’t wait to see the new and improved KK on the field. Jenn has given up on this blog. She basically just plays a dragon game about 20 hours a day so don’t expect to hear much from her in the future. Tuesday was the discdogathon qualifier, Key picked up a spot in freestyle and bullseye. Muse got a pairs D/A spot with Kirby and I. At the finals on Wednesday, both Key and Muse did a nice job but a missed throw here and there kept us off the podium. The weekend was the main event and the weather was terrible with rain, mud and cold. Friday was the last chance qualifier where Muse won the Sport Division (distance / accuracy) with Kirby while setting records for single round and two round scores. We also won the pairs freestyle division with Muse. Key tried to qualify but missed a lot of throws. She is jumping all over the place, but unfortunately not at an actual thrown disc usually. On Saturday, Muse had a solid D/A round and a second round of freestyle with no drops. It put us into the top 10. We could have done much better so it’s a bit of a disappointment. Sunday was the pairs freestyle and D/A finals. Kirby won D/A with Muse, setting the three round total score record in the process. We both played with Muse in D/A and I scratched her after Kirby had a higher score from the first round. Kirby has great chemistry with Muse and it’s pretty awesome they were able to accomplish what they did. I’m so happy for them both! After our first round of pairs freestyle, we were tied for 2nd place. With all the mud, Muse wasn’t trying to catch some of the throws. Very unusual for her, but I could tell she was a bit off. For the second round, we decided to move a bit to the side where the ground wasn’t as muddy. It resulted in a great round where we moved ahead for the win. Muse won two of the three main championship titles up for grabs this weekend. She’s an amazing talent and I’m as lucky to have her. Toss and fetch strategy is a subject that has come up numerous times lately. By strategy I am talking about how to maximize your score and what makes up a good toss and fetch round. I ran a session at a clinic on this subject and have had several conversations with people since. Although freestyle is my main focus, I still spend a lot of time on toss and fetch and have been able to consistently score high and win toss and fetch events. 1. The catch (in bounds). This is far and away the most important aspect of a toss and fetch round. This may seem obvious but frequently competitors will be throwing to a zone that is beyond their capabilities either for distance or for accuracy. I do a lot of drills to teach my dogs to catch discs from every possible angle and height. 2. The retrieve. This is the next most important aspect of a toss and fetch round. This is because if a dog has a slow retrieve, the time loss is compounded over the distance of the throw. I teach a fast retrieve using restrained recalls and tugging as a reward for a retrieve. 3. The exchange. This is the aspect I spend the most time training, despite not being QUITE AS important as the catch and retrieve. A good saying in my line of work is it takes 85% of the effort to get the last 15% done. I prefer to have a dog hand me the disc and go around. There are many different styles people have, but a hand-off with around is my preferred method. The hand-off generally takes a lot of time to teach (I use shaping, treat rewards and tug training to teach it). Having a hand-off helps me for my next throw and is also very efficient as I am not wasting time trying to get the disc off the ground. 1. To get the most points possible in any of the current organizations, you must throw for the highest zone that you can successfully achieve. Throw to the farthest zone that you can have a catching success rate in bounds of 90-100%. This means if your range is 40 yards, you should be throwing 40 yards, not 30. Many times competitors wonder if they could get more points throwing 20 or 30 yards and getting possibly an extra throw or two in, but this is never true. I will explain why – longer throws have many advantages. Dogs get up to higher speed on the way out and on the retrieve (if you have a fast retrieve). Being you will have fewer throws, there are fewer exchanges and fewer times where the dog has to stop and turn around after the catch. These are all time wasters. To get the maximum points in every organization, you must throw to the maximum zone, preferably the last zone, typically around 40 yards. To do this, spend many, many hours by yourself at the park throwing hundreds of discs. Lastly, the highest scoring zone can be worth bonus points. 2. Throw high. By high, I don’t mean 50′ in the air. I mean more like 8-10′. Most people do not do this though. They tend to try to throw line drives that they feel will be easier for the dogs to catch. Or they feel their dog has trouble catching discs that are high in the air. I hate to break it to you, but you have to spend the time to teach your dog how to find the disc above their head! I do this with hundreds and hundreds of repetitions with the dogs at short distance. It forces them to look up for the disc. Do not fall into the trap of throwing discs out in front of your dog at a height of 4-5′. This is a huge problem waiting to happen. You aren’t teaching your dog anything except put their head down and run without thinking. Another problem with low throws is they so often end up in the dirt and the poor dog is running 25mph and has no chance to catch it. It’s dangerous (the dog can tumble) and I always say this is the one rule I have in toss/fetch. DO NOT OUT-THROW YOUR DOG!!! Throwing a disc too low is the same as out-throwing them. By throwing higher, your dog always has a chance to catch the disc. Once they learn to watch and track, they will be more successful. Lastly, a low throw typically results in the dog having a long outrun. With a higher throw the dog will have to slow down right before catching, which will allow them to turn and come back fast. 3. 5 throws at 40 yards. This is a magic number and something that is discussed frequently at the highest level of competition. You must have a fast dog with an efficient exchange to get 5 throws at 40 yards. Most dogs that can do it get the 5th throw off with under 5 seconds left. At most local or regional level competitions there are only a handful of dog/handler combinations that can do it. 5 throws at 30 yards is not the same thing. That’s not bad, but it’s a whole different game trying to get 5 throws at 40 yards! Those are the most important aspects in terms of getting big scores. There are many other details on how to have a good toss and fetch round such as having fun, communication, positive thinking, timing yourself during practice, reading the wind and making adjustments on the fly. One other interesting discussion is sending the dog around. First, I suggest you DO send your dog around one way or another. Some people do not do this and have had no problems, but I have seen others develop into a problem where a dog cuts the return short and simply turns around to take off. Having an around will avoid any possibility of the dog cheating or taking a shortcut. As a right handed thrower, most people send their dog around clockwise. Teach both directions! You may find one way works better for one reason or another. Whether the dog can track better going one way or another or if you prefer to see your dog as they go around or if you prefer to have the dog give you the disc a certain way. See my video below of how sending the dog the opposite way (to conventional thinking) can be a plus. She hands me the disc while I’m in my throwing position. When I send her, I can’t see her but I am comfortable that I don’t have any need to see her based on the chemistry we have. As of 2015, I have the following target scores for a single round in each organization. Rules are always changing, so these numbers could be different in the future. Skyhoundz and USDDN 20+. UFO 15+. AWI 10+. To get these scores consistently, you have to be able to get 5 throws at 40 yards. I don’t record a lot of toss and fetch rounds but here’s how I prefer to do a toss and fetch round. This is Muse from 2014. Here’s Tooney from 2008 at the USDDN world finals with a 23 point round. She ended up with a 3rd place finish with 44 points. No hand-off but the rest is very smooth. My throwing form was a bit different then. I’m sure if I had a video from 1998, you would see that was also different from this. Constantly learning and adjusting every aspect of my game. For the 2nd year in a row, the Purina IDC was held close to where we live in Huntington Beach, CA. Friday was the qualifier and they take the top 2 teams to the regional on Saturday. Muse and I qualified and were the first team to go on Saturday. We had a decent freestyle round and hit both bonus throws. Our score held up until the very end. We finished in 2nd place and will probably get invited to the finals again this year. One interesting note is Muse and I have hit 7 of 8 bonus throws at the Western Regional in the past two years. For whatever reason, we missed both throws at the finals but hope to rectify that this year! Here were the placements. Kirby/Torch 1st and Mike/Maggey 3rd. This weekend is always one of the most popular in the southwest and this year was no different having competitors from at least 4 states. The weather was cool and overcast both days, which was great for the dogs. My elbow has been pretty screwed up with ulnar nerve issues. I had over 30 rounds over the weekend, so I am hoping my elbow didn’t get worse! Saturday was our Skyhoundz classic qualifier. Muse won the open division on the strength of two nice freestyle rounds and the highest D/A of 22 points. My crew took the top three spots in the sport division (D/A only). Muse won it, Slayte 2nd and Enzo 3rd. Key finished in 5th. My throws were surprisingly good considering my elbow. Of the throws, 26 were in the maximum 5 point zone (40 yards) and 5 were in the 30 yard zone. I normally don’t pay any attention to these numbers or statistics. I don’t really care to be honest. But I was asked the question from someone at the competition and then I figured I may as well just count them up out of curiosity and I am pleasantly surprised. On Sunday we had our discdogathon qualifier. It was a lot of fun with non-stop action in five different events. Muse won freestyle with a dropless round. She also won bullseye and got 2nd place in both spot landing and pairs D/A. Key got 3rd place in time trial. Here’s Muse doing freestyle without a miss!